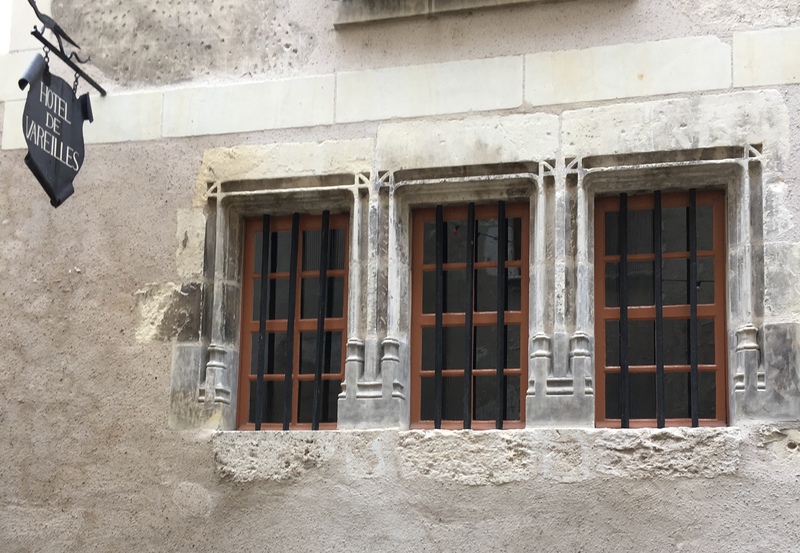 These three windows are on the street facade of Hotel de Vareilles, a town house built in the Puits Châtel quarter of Blois in the 16th century during the reign of Louis XII. Ces trois fenêtres se trouvent sur la façade de l’hôtel de Vareilles construit dans le quartier de Puits Chatel à Blois au seizième siècle sous la règne de Louis XII. Posted in: Blois, Historical buildings. Tagged: hôtel de Vareilles blois. Not to put too fine a point to it, but we call the colour of the paintwork ‘ Merde ‘. It was around in the 16C ? You mean the paintwork of the actual windows? That’s an interesting question. Maybe Susan has the answer. I would assume they would have been oak coloured. The street is full of listed buildings such as this one but when you see some of the details you wonder what the National Monument architect was doing. It’s obviously who you are friends with :).